U.S.A. –-(Ammoland.com)- You can choose ANY round and make a case for it. Do you want REAL penetration? .41 mag, you want penetration in an auto? .357 Sig. Do you want conceal-ability? A .32 or .25 will do you best. So as an old experienced NRA instructor, with a bit more gray in my hair than I like to think about I’m going to tell you a secret. It’s all crap. Pick the gun that best fits your hand in the largest caliber you can COMFORTABLY handle. People have different size hands and length fingers. Hand strength varies. Personal centers of mass are different and affect how we react to recoil. These things all effect shot placement and follow up. While I have my views on .45 Vs. 9mm, the simple fact is two to the chest is better than a miss and a through and through that grazes the side regardless of the caliber you select. For a 1st-time gun buyer step one, go to the range and rent and shoot EVERYTHING. From a Shield to a Glock to a 1911 to a GP101. Try them all. If you don’t have free available instruction, pay for it. It’s your life we’re talking about. No one cares about it more than you and the ones you love. I have two students; they took this all to heart. Took the full NRA 1st steps course, joined the local range and over the course of a month or so shot everything I owned and everything they could get their hands on. J, He shot as a kid, and this was re-introduction to handguns after a 30-year break. His hand size leads him to a 1911, and his body type and hand strength make the gun a 9mm. He can shoot the gun in .45 he’s just a bit more comfortable with the 9mm. Regular practice and a clean gun are now part of his life. K, is a woman executive in the entertainment industry, and after shooting a dozen guns in all different calibers, she chose a GP 100 in 357. The first four rounds are .38 special the last two are .357. The guy at the gun store informed her she needed more rounds and should buy a Glock. She asked how many rounds did she need? This woman has ice water in her veins, and she practices regularly to remain sharp with her selection. This leads us to the last two important issues. Practice…Practice… Practice. Join a gun club and make new friends shoot once a week. Be competent with your firearm, keep it clean, and store it properly and safely. With the right to own a gun comes the responsibility to be safe and proficient. Second be careful who gives you advice. I’ve seen gun store salespeople start the conversation with “Which Glock would you like, most people buy a model 19… let me get you one…” My hands are a man’s XL, but a Glock is a bad fit for me, my G34 was dremeled down to get close to fitting my hands. Just because a man or woman works at a gun store does NOT mean they know about fitting a gun to a person or how to help them make the right choice. A new shooter will have no idea how a gun should fit in their hand and buys from ignorance. With 100,000+ NRA instructors, you should find one easily available. The NRA even set up a page to help you find an instructor. There’s also an online course to help you get started. One last story and a warning– At a basic NRA class a year or so ago a young woman said that she had just bought her gun and asked if she could shoot it as part of the class. I asked what she owned, and she pulled a brand new Glock 19 out of her purse. (Yes, we had all the usual no firearms in the classroom warning in the announcement and on the doors.) Made sure she was not touching the trigger and gently took the unloaded pistol. She proudly announced to the room “IT’s a GLOCK!” asked if I owned one like it. I said no, my striker fired gun was a Springfield. She looked crushed and asked, “did I buy the wrong gun?” I’ve since replaced the Springfield with a Glock. But this story carries with it a warning, as an instructor you are to help a student make a choice that is right for THEM, not to validate your decision in the choice of a firearm you made. Hear that Glock-fan boy. As an instructor leave your ego at the door. A gun that fits the hand and the biggest caliber that the shooter can manage are what matters, not the brand or caliber chosen. Don McDougall is an NRA instructor and member of the Los Padres “Friends of the NRA” committee. If he’s not at the range you will find him setting the record straight with on gun issues and gun safety onAmmoLand Shooting Sports News. glock 30sf 45 acp concealable but kinda fat & heavy which is awesome for recoil, and high capacity, in my opinion its one of the best, plus no safeties on glocks, well not really, just point and shoot, and no matter what they tell you 45 acp is the best. Also look it up the highest a 357 sig gets is 614 fpe and the 45 is 616 so no the 357 sig is not more powerful than the mighty manstopper, get ya facts right chief. 10mm is but its pricey too. 45 rules. @Christianitalian, I can not speak for stan, but I really get a kick out of shooting Liberty ammunition. It is really light to carry and really fast. Oh… and did I mention… really expensive. I posted a comment about the 380 and M&P Shield 9mm! Where is it at? I agree that you should pick the best gun and caliber that fits you best, but I disagree that you should get the biggest caliber you can handle. The 357 Sig is superior to 45 acp so why would I carry a 45 that is bigger. Do to .357 Sig in Underwood ammo in 125 grain having 1475 fps and 604 do the hollow points always expand something you can not say about a slow moving 45. My background I carried 9mm in Military and when I came out I was 45 or nothing so no haven’t been a 357 Sig fanboy. I just learned I should be using what is best and as far as best all around Pistol self defense round it is .357 Sig. If you can carry 357 Sig and shoot it accurately I say carry it above all. If you can fire 9mm much more accurate get a 9mm with hot Underwood ammo. Or get what ever you want. But if you can’t do accurate rapid fire to save your life why are you carrying it? If you can’t perform accurately with follow on shots, then you picked a caliber that you cannot handle. That is one of the key points of the article. The. 357 sig only gains an extra 300 fps over a 9mm (at best) in factory loadings, with the requisite additional recoil. Tested, of course, in 4.5 inch barrels which, though not terrible, are certainly not ideal for a new concealed carrier. Finally, .357 sig ammo is more than twice the price of 9mm, and half again that of .45 acp. There is no reason to encourage a new shooter to purchase expensive ammo when they need to be getting all the practice that they possibly can. While .357 sig may be a fine cartridge, it is hardly geared towards a new gun owner. You write a comment in an attempt to correct my comment and in your first sentence you re iterate my last sentence. Did you even pay attention when reading my comment? We are talking about self defense someones life at stake and you’re saying peoples lives are not worth 30 cents more a round? The 357 Sig is not only 300 fps faster but what about the fp more it brings? When my life my family and friends lives are in danger I don’t care about some change. Also what is the point of buying an expensive handgun to save your life and than being cheap and loading it with something other than the best ammo you can? I say everyone should carry what they are most accurate with but if you can be extremely accurate with 357 Sig get it because I can’t find a better all around self defense handgun round out there especially when your feeding it Underwood ammo. JCourson You write a comment acting as if I am giving new gun owners bad advice and in your first sentence you reiterate my last sentence. Did you even pay attention when reading my comment? We are talking about self defense someone or several peoples lives at stake and you’re saying peoples lives are not worth 30 cents more a round? The 357 Sig is not only 300 fps (Feet Per second) faster which is extremely important in a self defense pistol round, not sure why you say “357 sig only gains an extra 300 fps over a 9mm” Because a lot of 9mm ammo is only around 300 something fps so that would make 357 Sig almost twice as fast as some 9mm ammo. Also what about the around 200 ft. lbs more 357 Sig brings? When my life my family and friends lives are in danger I don’t care about some change. Also what is the point of buying an expensive handgun to save your life and than being cheap and loading it with something other than the best ammo you can? I say everyone should carry what they are most accurate with but if you can be accurate with 357 Sig get it because I can’t find a better all around self defense handgun round out there especially when your feeding it Underwood ammo. Also You can take a 40 cal handgun and in many guns make it 357 Sig with nothing more than 357 Sig barrel. I just got a S&W M&P 40. I got a 357 Sig barrel and a 9mm barrel. 3 calibers in 1 gun can’t beat it. My wife has small hands, Small hands. We went to every gun store in town trying on guns. The only full sized 9mm she could reasonably use was an M&P9 with the small back strap and she has done well with it in different handgun classes. She even bought a M&P22 because it was the same size as the M&P9 and cheap to shoot. However, she has also purchased a Bersa Firestorm 380 and a Sig P938 because they fit her even better. None of these were what any salesman wanted to sell her. Agree with the basics of the article – experiment, try out a bunch, pick the one that fits you best and that you shoot the best, caliber be damned. First timers are gullible due to lack of knowledge and experience, and many gun sales personnel will take advantage of that. My wife is a good example. Although we’ve been married for four decades and I’ve had firearms all that time (retired military), she had never shown an interest until recently. So, we started with my collection. She tried everything I had, and it soon became clear that she did not have the hand strength to cycle most of my semi-auto pistols. She selected a revolver for her first range experience, and that turned out to be the right choice for her; the revolver is all stainless steel with a 4 inch barrel, so recoil was easy to manage and the grip fit her well. She decided later that she wanted a semi-auto. Here’s where the sales pitch began. I stood back and watched. In several stores, the sales person would direct her to the Glocks or Sigs, without considering anything about her. She would tell them of her trouble in cycling the pistol; they ignored that, saying she can learn a technique to overcome the weakness. In one case, the sales person did listen and showed her a Sig P238, super easy to cycle and fit her perfectly. However, the sales person didn’t mention the 238 was a single action based on the 1911; my wife was not told that she just couldn’t pick it up and pull the trigger. This is where I stepped in. The sales person shot eye daggers at me for interfering, but the truth needed to be told. She ended up with a little Remington RM380, easy to cycle, easy to shoot, double action only. She still wants the 238, or maybe even the Sig P938, but wants to get some range time with them first. Lesson learned! .38 Special and .357 Sig thru the same gun? I didn’t understand that part. Also, there’s no .25 in the photo. 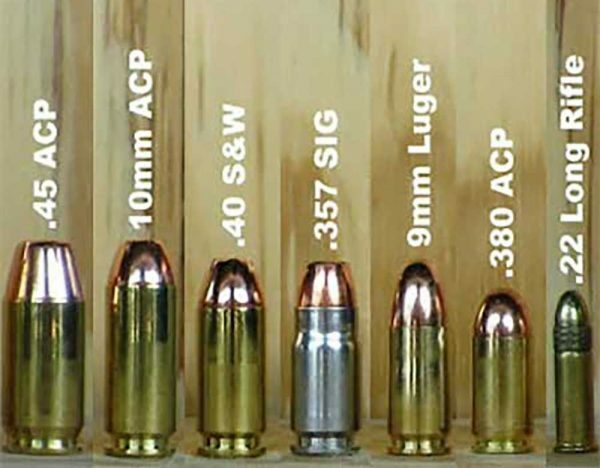 .38 special and .357 [magnum] are the same diameter and both will fire through any revolver chambered for the .357 magnum, [but a .357 magnum will not fit in a revolver chambered for a .38 special, it’s too long], the difference is in the amount of powder and the length !! A 38 Special will fire just fine through a 357 , but NOT the reverse due to the increase pressures. The 38 Special makes for a cheaper practice round. That is because rimfires are a terrible choice for self defense. He didn’t say .357 Sig, kust .357, inferring a .357 magnum. I agree with Kieth I noticed that right away it’s 10 mm auto not acp. There are semantics and then there are re-loaders. I’m still, even after over fifty years, still scratching my head. @Don L Bailey, I think that tight language is important. Loose language leads to misnomer, miscommunication, misunderstanding, and misinformation. Some people use vague or wrong terms to intentionally deceive … mostly salesmen and socialist libtards. But the application of loose language is, also, taught in the finest Journalism programs, MBA programs, and law schools. Think mag vs clip or the confusion about auto vs semi-auto.